Though it’s not particularly well understood, researchers know that hormones (androgens), bacteria (P. acnes), and an overproduction of sebum (oil) all play important roles in acne causation. Recently, oxidative stress and inflammation have gained more attention, as some researchers report that inflammation may even start the acne process. Opinions regarding the function that diet plays in acne care range between having no role at all to diet being a vitally important player. However, recent studies show that diet may be very important with regards to both cause and treatment. 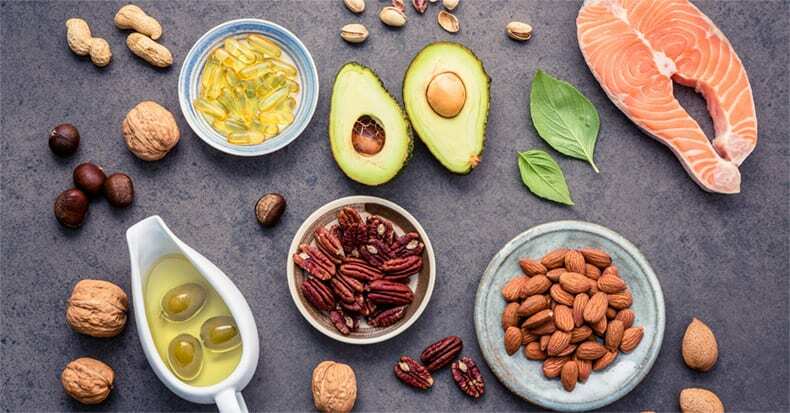 One such study placed subjects on a diet high in fiber, omega-3 fatty acids from fish and seafood, and total protein, and low in sugar and saturated fats. After twelve weeks, the researchers observed a clinically significant improvement in acne with an average of 22 fewer acne lesions in those consuming the special diet vs. participants who maintained their normal diet. Similarly, in a one-year study, 87% of over 2,200 acne sufferers reported improvements in their acne after switching to the South Beach diet, which is similar to the findings from the study mentioned above. Of the total, over 80% reported that their acne improved within three months of starting the diet and 91% reported either discontinuing or reducing their acne medication use. What about milk? Harvard University-based researchers published three important studies involving over 60,000 individuals that concluded avoiding dairy products, with the exception of fermented yogurt, can help manage acne. RECOMMENDATION SUMMARY (Please consult with your doctor before starting any diet): 1) No dairy; 2) Omega-3 (1-4g/d); 3) Anti-oxidants such as vitamins A and E (20mg/d), selenium (400mcg/d), and curcumin; 4) Zinc (oral 15mg/d and topical); and 5) Chromium (200-400mcg). Many doctors of chiropractic can assist with nutritional counseling to help guide those with acne in deciding which dietary approach may work best for them.